Being the only true city in the Balearic Islands, Palma de Mallorca is an ideal option for a revitalizing city break. Old town narrow streets and restored cathedrals stand proudly alongside urban commercial establishments, making it a town of eclectic charm. Tourists who thought the city was all about sun and sand will be pleasantly surprised witnessing the iconic buildings and its artistic heritage. One of the best ways to discover the charms of Palma de Mallorca is to take a car hire and drive to the famous attractions. 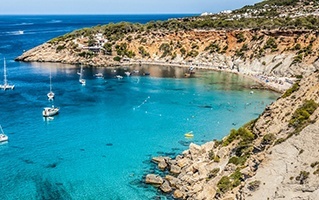 The crystal clear waters, sporting events, relaxing beach walks and sailing luxury are just some of the highlights of Palma de Mallorca beaches. In your car rental taken at Palma de Mallorca, you can also head to the Majorca’s attractions that are within one hour’s drive from the city. Hertz car hire services in Palma de Mallorca provide complete peace of mind to travellers visiting the city for the first time. You can use the navigation systems to find your destinations and get all this at a guaranteed best price on every Hertz booking. Whether you’re visiting for the food and wine, the architectural wonders, the sun-kissed beaches or the Mediterranean climate, having a car rental in Palma de Mallorca will make your vacation much more convenient and rewarding.